On Saturday, some 10,000 protesters crowded Pearl Square in Manama, the capital of Bahrain, for the first mass protest since March, according to AP. There was little regime violence when compared to past massacres, but even so, the Fédération Internationale de l'Automobile (FIA) announced that the Formula One Grand Prix race that was scheduled for Bahrain in October would be postponed until next year. 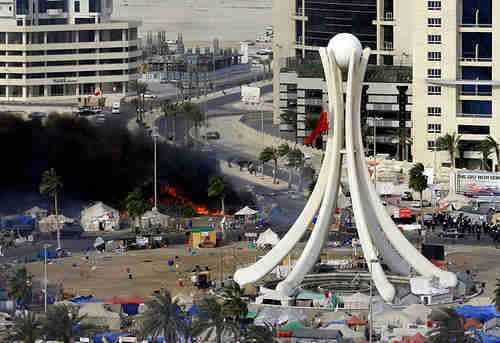 Manama's Pearl Square after March 15 protests. The beautiful Pearl monument was torn down by the regime on March 18, because it was thought to be encouraging protests. The protests began in February, after similar protests in Tunisia and Egypt had caused long-time leaders in both those countries to step down. At that time, word came out of both Bahrain and Saudi Arabia that under no circumstances would protesters be permitted bring down the Al Khalifa family, Bahrain's monarchy. The Saudi-led Gulf Cooperation Council (GCC) sent 1,500 troops into Bahrain to take over non-combat roles, so that Bahrain's security forces would be freed to carry out bloody massacres, arrests and tortures against peaceful protesters. Bahrain has a Sunni Muslim government, although the country's population is 2/3 Shia Muslim, so almost all of the massacres, arrests and tortures were directed at Shia Muslims. Although Shia and Sunni Muslims have had good relations for many years, the protests have created a wide sectarian divide, according to Reuters. Thus, it's feared that there could be new violence in Bahrain at any time. Indeed, a top Bahraini Shia cleric said that trials of dozens of people and the breaking up of Shia religious marches were dragging the country towards destruction, not reconciliation, according to Reuters. The opening race of Bahrain's Grand Prix had originally been scheduled for March 13, but the FIA canceled it on February 21 because of the protests and the massacres. "It's obvious that everybody feels they need to be safe when we get there. In the end we'll have to wait and see what happens in Bahrain. If there is peace and no problems then I suppose the teams will be all right." "By the time the grand prix arrives we will be able to remind the world about Bahrain at its best. The Bahrain Grand Prix has always been a source of national pride and it is an event than transcends politics. Its positive effect will be felt throughout the country." 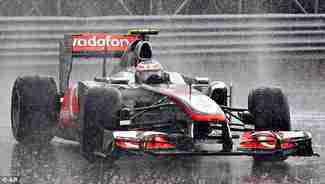 "Formula One's decision is a kick in the teeth for the Bahraini people. Now F1, plus Red Bull, McLaren, Ferrari, and every other team will be directly linked with a bloody crackdown that's ruined the lives of hundreds of innocent people." "What we can say with confidence is that the ultimate decision to cancel the reinstatement had nothing to do with Formula One's distress over the deaths of more than 30 Bahrainis, the alleged arrests of many circuit employees because they happened to be of the wrong Islamic denomination, or the detaining of doctors and nurses who treated those injured in the protests and were thus deemed to have acted against the government's interests. ... Instead the decision was forced upon the FIA by image-conscious sponsors and by the teams' reluctance to make an extra long-haul trip which would shorten their hard-worked staffs' holidays." In many ways, the tension between morals and commercial interests reflects the tension between morals and political interests that many countries, including the U.S., have felt in dealing with the situation in Bahrain. Manama is the headquarters of the U.S. Navy's Fifth Fleet, with responsibility for the area stretching from the Red Sea to the Indian Ocean, including the Arabian Sea and the entire Persian Gulf. There was little or no violence in Saturday's protests. A lot of people will be relieved if there isn't any more sectarian violence.